I reluctantly chose to use my Remington 760 rifle this year. 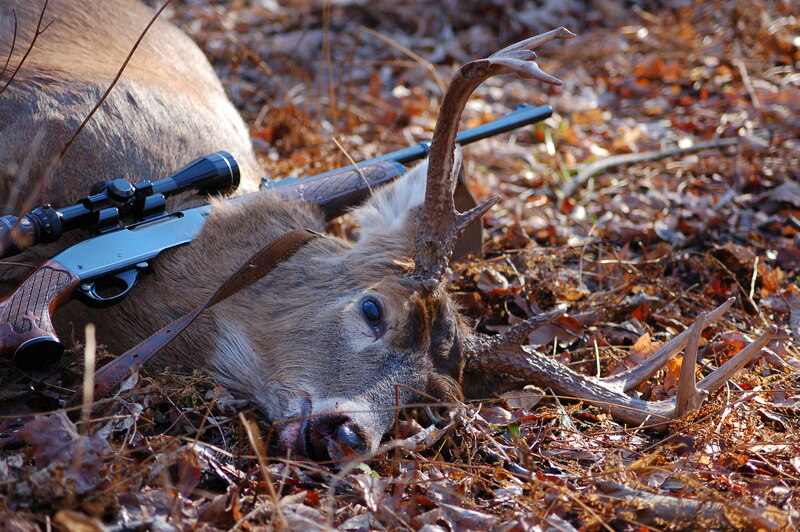 Over the years I have used my flintlock rifles during deer season around 95% of the times out. I enjoy the challenge of hunting as my forefathers did. However, as most hunters know the flintlock does have limitations. 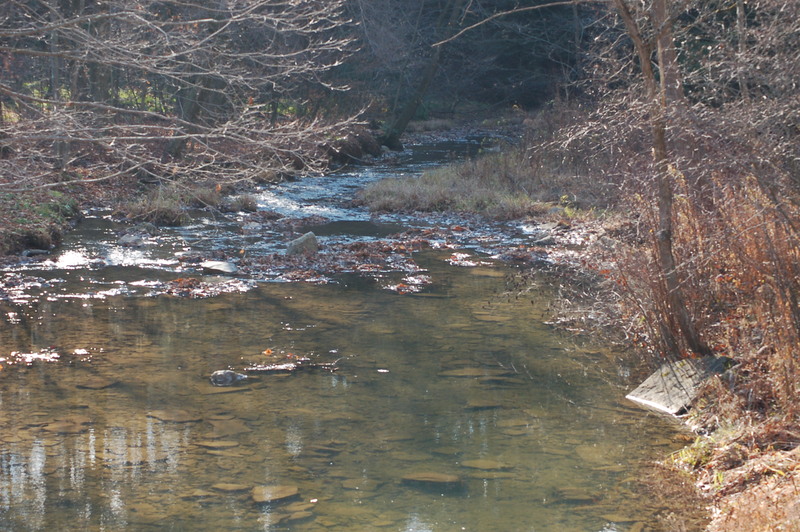 The Pennsylvania Game Commission changed the regulations in the past. The area I hunt, the regs are that the buck has to have, at least, 4 points on one side. That ruling was alright with me since I had become a deer hunter not a buck hunter some time ago. I have received more satisfaction with harvesting a doe with the primitive firearm than harvesting a buck with the rifle. Last year the regs changed again. The hunter could only hunt buck during the first week and both sexes during the last week. My tradition had become to hunt buck only the first day and , at least, the first half of the second day. By noon on the second day I would take a doe if an excellent shot was presented. The new changes eliminated that option. I decided to not handicap myself with the buck only season. Counting the points accurately is difficult with the naked eye, and an aging one at that! The time trying to use binoculars and moving the flintlock into position is time consuming when a deer may only be viewed for seconds. So out comes the 30:06 rifle! The Pines... The micro-burst area is towards the viewer's left. I sat down to await the dawn when a gobbler exploded his whereabouts from the very same pines I listened at for a few times during the fall season. Later I saw him fly down. I chuckled to myself. The days I listened here were windy and rainy I told myself…trying to justify why I hadn’t heard him then. 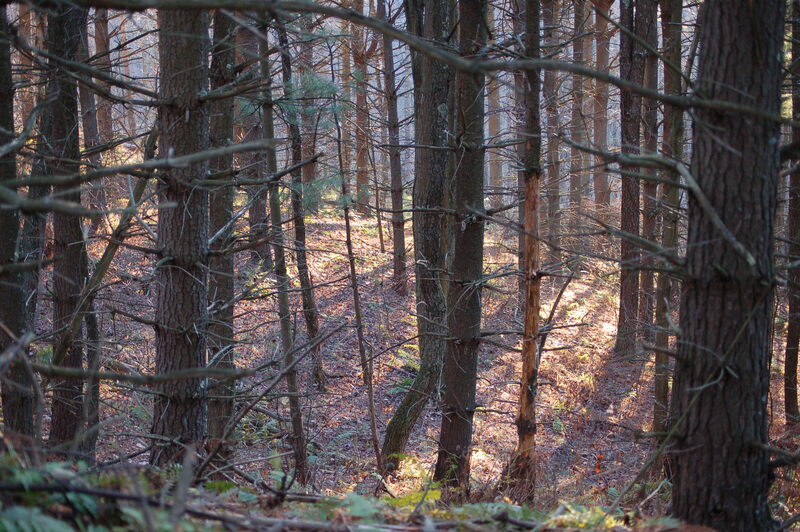 I hunted only a short distance when I saw a hint of a deer about 40 yards away. I squatted down in preparation. Shortly, I saw a small spike and another illegal-racked buck along with some does. I was, slightly disappointed, when I saw antlers coming up and over the crest of the hill. Nice rack! I tried counting with the eyes, but soon realized I had a chance to move the rifle to my shoulders undetected from all those eyes. The buck was now behind some limbs. He turned his head and I believed I could count 4 points . I had an opening about the size of a pie-pan when the shot rang out. I knew immediately I had a great shot. The big buck lay 35 yards from where I shot. The scary aspect of the shot was that I still wondered if I had made an accurate count. What if? I don’t like having those feelings of doubt. The big deer was huge. The weight was certainly over 200 pounds. The rack sported 8 points. He was originally a ten-point with two broken. The span is 17 inches at the widest area. As is my custom, I spent a few moments in thanks to the majestic creature. I have much respect for the natural world. The taking of an animal from the wild should not be done so in a manner of disrespect. Far too may hunters treat the wilds in such a manner! The drag out of the woods was tough. I shot this buck in an area where a micro-burst occurred around 6 years ago so plenty of pine tops are scattered about the forest floor. 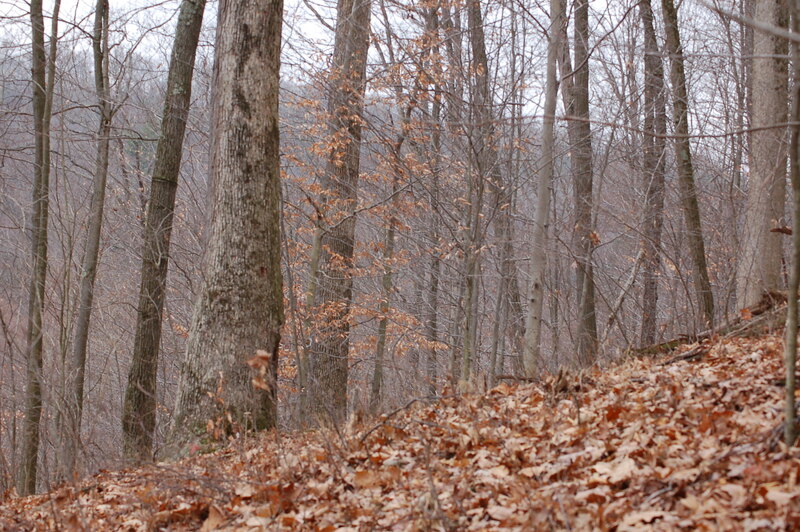 After a day at my mother’s place for Thanksgiving, I planned a day in the woods searching out the wild turkey again. Things were looking bleak for me this fall. 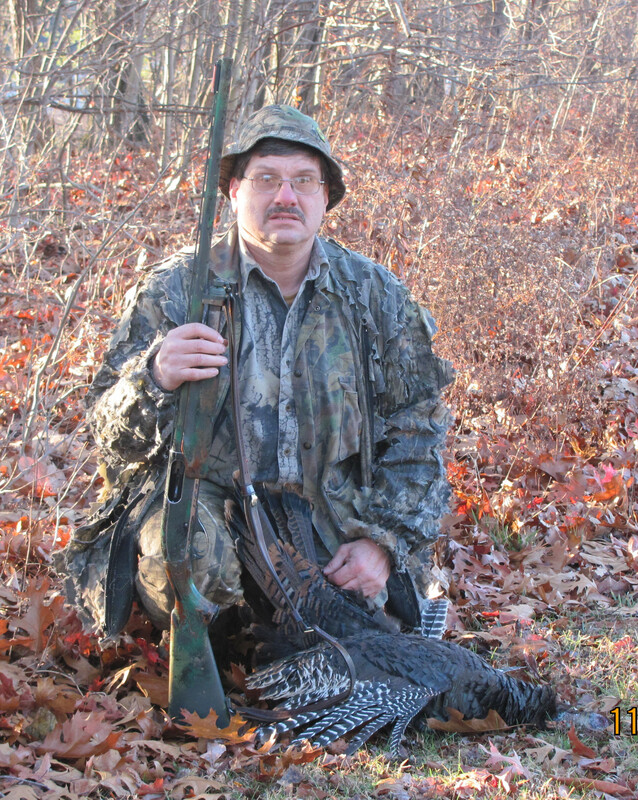 I passed up several birds so Bob (my step-father) could get his first turkey. I worked hard and walked many miles to find turkeys after that. Fate played it’s hand and caused many things to occur to produce days without a shot. I failed to shoot at flying birds (my own tradition); turkeys went into posted lands; birds flew across a road; I failed to break birds up in order to call them in. The season has been tough on an aging feller! I went to Cherry Run first to listen for roosting birds in some pines.I hoped they may have roosted in those trees to shelter from the rains and winds. The entire day would prove to windy. Later I walked about searching for feeding birds to break up. At this site I did not find any turkeys. However, I did see a dandy of a buck chasing does. I saw him twice. His antlers would be at least 18 inches across if not more. The second place I checked out was where Bob shot his first turkey on November 13th. The area was clean of turkeys except a longbeard that I spooked. The gobbler was alone and I figured calling him in would be difficult since after 40 minutes of calling the winds had chills forming down my spine. The third area I went to was my last chance for the day. I saw two other turkey hunters so I crossed the top of the hill and entered some pines on the back side. I didn’t go far when I saw a turkey approximately 120 yards down hill. I peaked around the tree and continued watching. In short order I realized a flock was present. I ditched my orange and placed my hat behind me and tried calling. They seemed uninterested. I knew I needed to try to break them up. My charge wasn’t very successful due to many tree tops and my fear of going “head over heels.” I wasn’t sure what happened to the turkeys because of brush and terrain, but I sat down to wait. 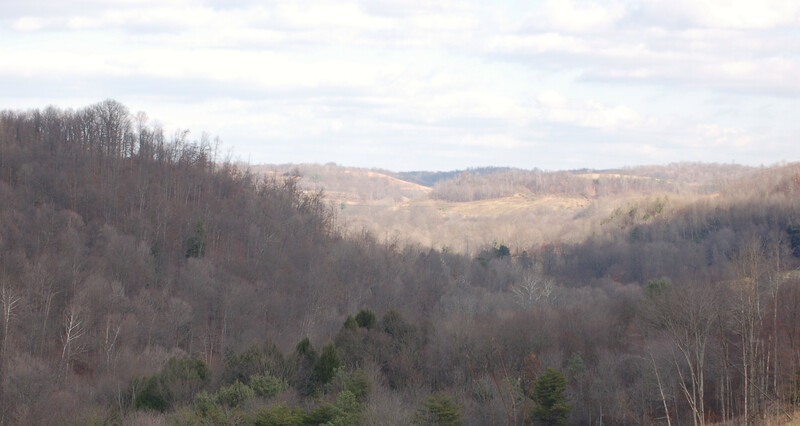 Twenty minutes later I began to call and was answered across the hollow.. across a township road… and in posted property. We carried on a nice communication when the adult hen opened up in the same area. Normally, a hunter would try to run her away, but the posted property would not permit that plan to happen. Almost an hour had passed with me calling periodically hoping a stray turkey might answer. Suddenly, yelps were heard behind me. I used my voice to call and a turkey came running through the woods towards me. I couldn’t keep the sights on the bird due to speed. AT twelve yards the turkey stopped and a limb was directly in line. She turned and flew away. I couldn’t believe how this season had transpired for me with bad fate. Shortly, I decided no other birds were around and I moved in the direction the turkey flew. I sat against a tree and began to call. I heard a cluck, then another and close yelps. Using my voice I encouraged the turkey on in finally allowing for a shot. The young hen, almost again, escaped my shot. The brush, terrain and her speed coming in was such that I had one chance only. the time was 2:20 P.M. I think tomorrow I will rest and paint. 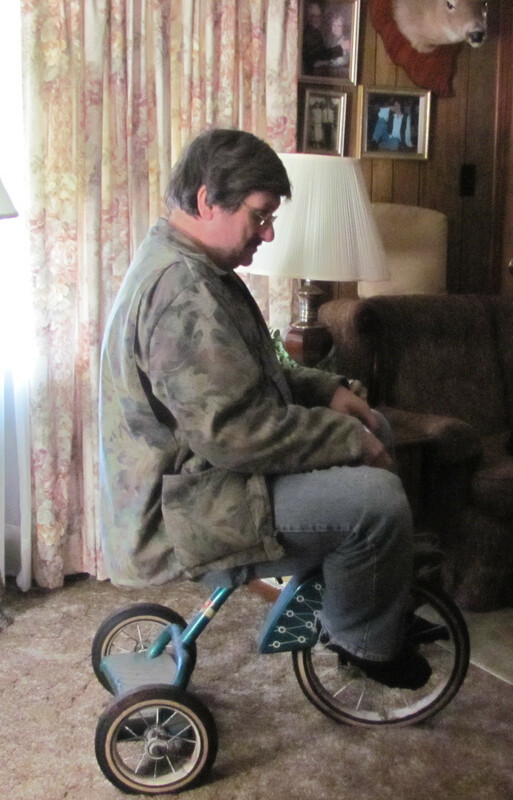 Another turkey on his childhood tricycle. Today is the first day of the Pennsylvania black bear season. I decided to head north to State Game Lands 137 between South Bethlehem and Distant, Pennsylvania. The bear have a lot of great habitat at this area. Multiflora rose and autumn olive make for dense areas. ( I have the thorns embedded in my flesh, as I type, to prove this!) A lone hunter has to rely on a lot of luck to bag a bruin here. I heard some shooting in the distance and, I believe, I heard three shots at the back side of the game lands too. I didn’t see any bear, but I wasn’t really expecting to see any. I follow this annual bear hunt ritual, but I have to admit I don’t put the effort into bear hunting that I should. Once one has taken a bear sometimes the work following the shot dampens the desire to get another. This is difficult to explain to a non-hunter. I shot a bear in the past and hollered “bear down” and was blessed to have helpers show up over time. Four of us would carry the bear and two others carried the rifles. 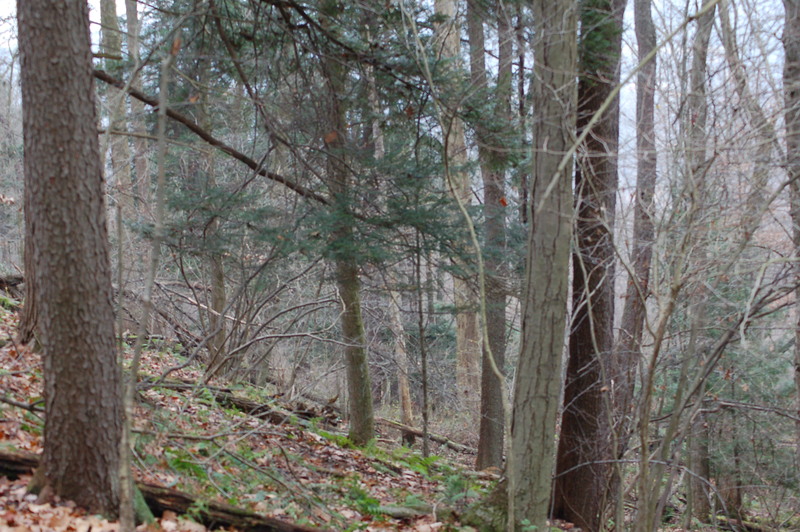 The terrain wasn’t all that steep, but mountain laurel was abundant making traveling difficult. Thankfully, with permission, another hunter drove through a field with more help to get the bear out and loaded. I made sure the landowner had a bear roast! At the game lands I saw deer, grouse, squirrels, both gray and fox squirrels. 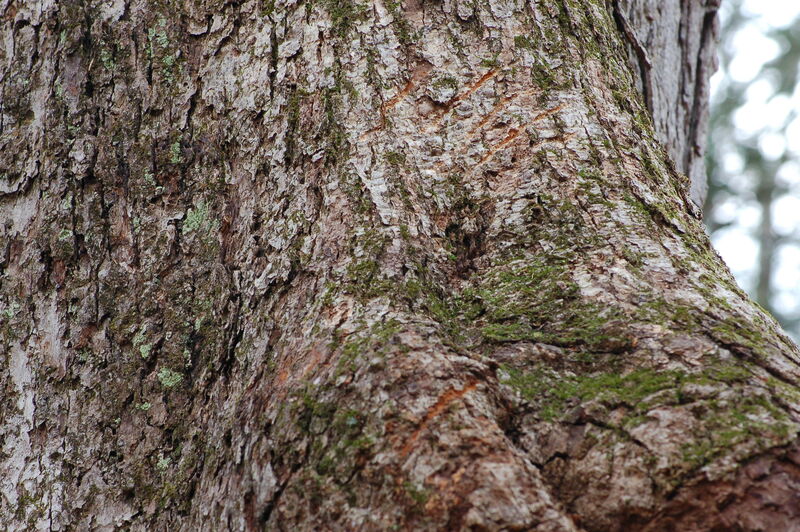 I was entertained watching one fox squirrel winterize the nest. And , guess what… I heard a turkey! The bird looked over a bench and saw my beacon-orange clothing and headed off quickly! The only bear sign I saw were the claw marks on a bee tree. By the way, the bear mentioned above weighed 235 pounds. The meat was very good. The bear fat fed my birds over a couple of winters and some went to Indian reenactors to grease down their hair. This makes a very shiny hair. Our Native Americans actually used bear fat for this purpose. I heard the temperatures are supposed to get into te 60’s on Monday. Sounds like a half day bear hunt for me. I felt the need to get away from the noisy areas. I went farther south into the Cherry Run hills and valleys. This is my country. I was raised crawling up and over these hills. I thank my father for introducing the Cherry Run watershed to me early in my life. I think they are beautiful and they are filled with memories. I walked non-stop from 6:15 A.M. until a little after one. I didn’t see a turkey, but that was alright since I had time to reflect on my past once again. Like I said …lots of memories! I saw some deer, grouse and squirrels and a bird I do not see often anymore… the woodcock! There used to be a lot more around, but the habitat they require is becoming increasingly scarce. They need brushy areas and wetland type of habitat. I, also saw a great horned owl and either a coyote or a dull-colored red fox! Needless to say those high and steep hills had me feeling rather tired by the time I returned home. Awwwwwww the golden years are coming. I anxiously walked through the pre-morning darkness to set up and listen for roosting turkeys. Yesterday, November 17th was very windy.Towards 7:00 A.M. I called and heard a distant reply. The problem was I wasn’t sure where. This area is close to SR 422 and the truck noise can be awful, especially for a couple of hours at dawn. Apparently the atmospheric conditions allow the noise to be stronger on certain days. I had been plaqued by this problem at three different sites. The site where Bob shot his first fall bird is about 1 1/2 miles away too and the noise was bad until mid-morning. The birds were not very vocal and quit before I wanted them too. I did realise the turkeys were low in the hollow and near a residence. I began a stalk and call routine across the area prior to making a complete circle when I walked into a flock of birds. I tried to get a break, but failed to do so. The time was 9:55. This one acre area had been part of a micro-burst about 6 years ago. The uprooted trees were completely engulfed in briars, of which, I became entangled in. I looked up and witnessed a second flush about 28-30 yards from me. The turks had difficulty getting airborne in the brush and a shot would have been relatively easy. However, my tactics for fall birds are to call them in, so the thought of raising the shotgun to fire never crossed my mind at that time. Later I wished I would have. Unfortunately, this flush occurred within eye site of the SR 422 at the Cherry Run and Margaret intersection. t Although the hill-side was about a 1/2 of a mile the terrible noise was deafening this morning! I called loudly whenever a brief (and I mean brief) in the traffic happened. I did this for an hour. I searched about and didn’t see a feather. A friend said he saw turkeys crossing over 422. AT noon I left for another site and failed to locate any turkeys. Critters I had seen this day were many. I saw deer and two bucks. I saw a lot of squirrels. I was w sneaking along when I heard a grouse scolding me. I looked and two grouse were walking about scolding me. I entered the darkened woods early and proceeded to hike the half hour walk. I was planning to be set up across a hollow where I hoped the turkeys would be roosting remembering the birds I saw along the road yesterday. I knew they had to be close. At the conclusion of my second series of soft “tree talk”, I heard a cluck exactly where I suspected they might be located. The second series brought more talk and for the next 40 minutes we carried on quite a conversation. The only question for me was would the entire flock cross the hollow and walk to me? 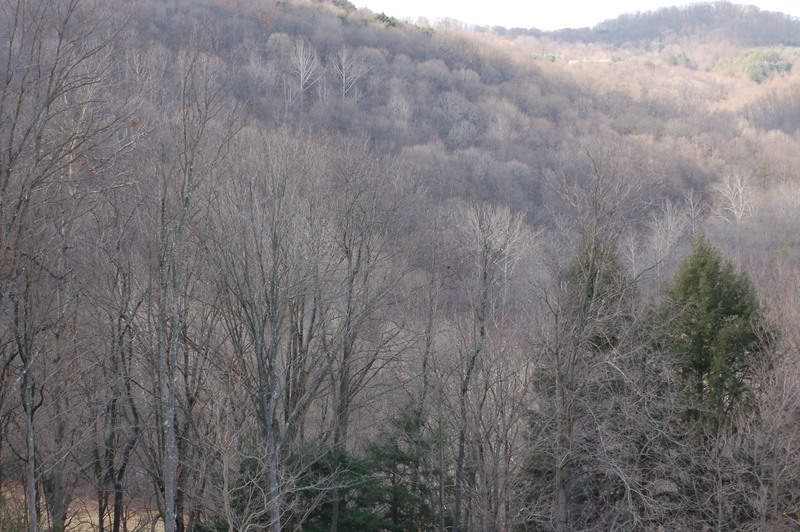 I heard several fly down and I soon came to the realization that they were heading upslope towards the posted property. I walked the line and saw the flock only to watch them run deeper into the posted property. I saw a number of deer, several grouse and some squirrels. I saw two buck. One sported a nice size rack. He walked about twenty yards from me and I could not say if he had the amount of points to be considered legal in Pennsylvania. I quit about 11:15 with my Gore-Tex boots allowing the water to penetrate my feet. I stopped by my mom’s place to see what was going on. I am not sure about hunting tomorrow. Weather will play a part, but another committment is pulling me away by 10:30. 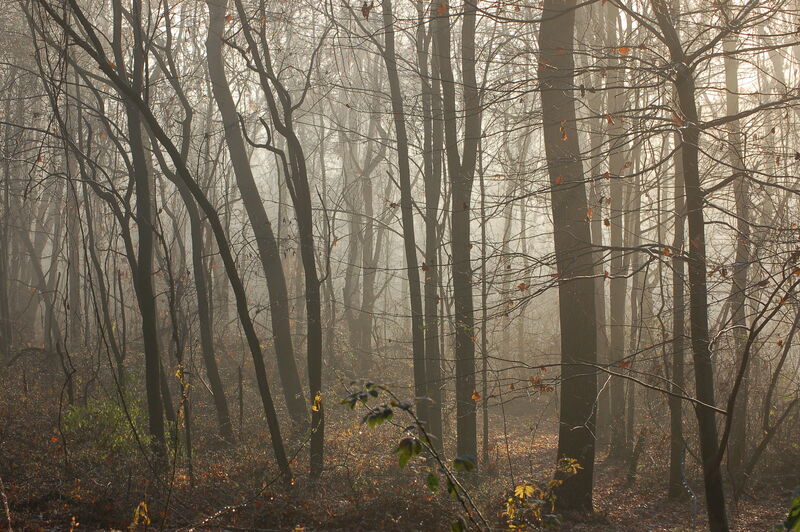 The all-day rain of Sunday (November 14) helped put into place all the requirements for a heavy fog throughout the woods this morning. The fog didn’t lift until after 10:00! Regardless of the fog, I was perched along the hill waiting for whatever the natural world had to offer. I searched hard all day for turkeys. Saturday, while hunting, Bob and I witnessed over 50 turkey sightings. Today …nothing! Today, I hunted three different areas and didn’t see a bird. I saw deer, grouse and squirrels. Each area was covered with turkey scratchings, but apparently all of the turkeys were in neighboring acreage on this day. I heard one cackle across a road behing an eight foot high fence. The last site I elected to check out proved to be a fruitless adventure too. That is until, I started home along the road. I made a turn on the road and, you guessed it…TURKEYS! I drove up to them before they finally took to the air. I am considering hunting there tomorrow depending on the rain factor. The only negative element is the birds entered a posted property. The area I had just left borders that property. Maybe, they would have had time to roost along the property’s border. Last year, I called to some roosting birds in this area and called the flock in…… could I be lucky again?? 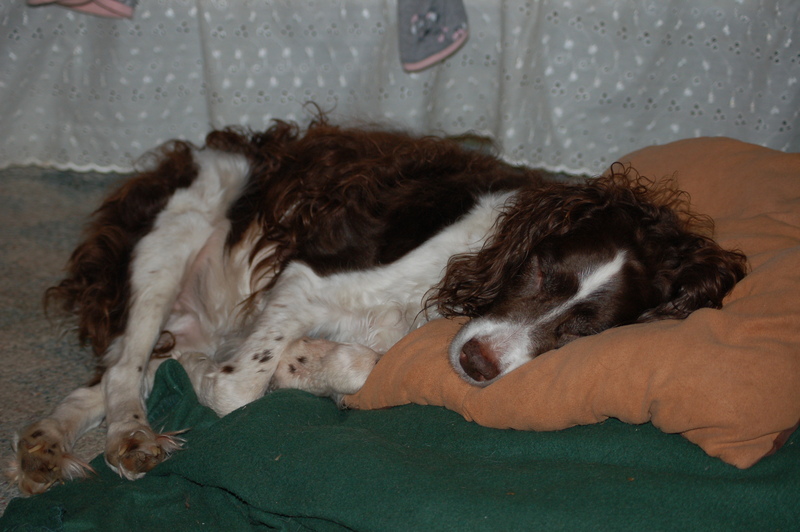 I thought a photo of Susie would be nice…Talk about a “dog’s life”. I included this photo although it has nothing to do with the theme, but hey…it is my blog and I can do whatever I wish! Right?